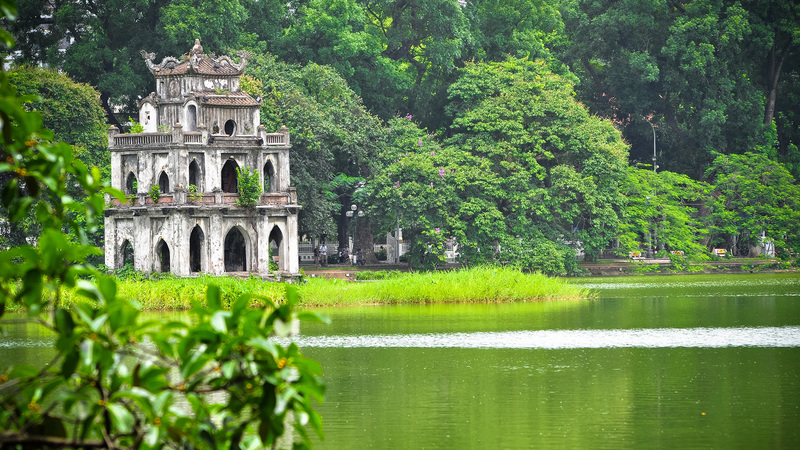 Hoan Kiem Lake is one of the most exciting and interesting attractions in Hanoi. Tourists visiting Hanoi always take the chance to visit Hoan Kiem Lake as it is a really ideal place to explore and experience the daily life of Hanoi people. Making the use of time to glimpse the sun rise and sun set in Hoan Kiem Lake will give you a deep and impressive feeling about this place. Known with the name “Lake of the Restored Sword”, Hoan Kiem Lake is one of the most attractive and impressive places in Hanoi – the capital of Vietnam. All of the tourists including those at home and in the world come to Hanoi try to visit Hoan Kiem Lake once as its popularity and spread. Next to the Lake, there is Ngoc Son Temple that you can take a visit to. Walking across the flag – lined bright red Huc Bridge, you will reach Ngoc Son Temple. Inside the pagoda, you will see a large bronze bust and other deities. There are altars to Tran Hung Dao, some ancient artifacts including ceramics and a preserved specimen of a giant turtle found in the lake weighing 250kg. Especially, you should not miss the chance to admire the sunrise in the early morning at Hoan Kiem Lake. Getting up early and going to Hoan Kiem Lake, you absolutely will surprise at the pace of life here. There are many residents who live nearby the Lake, they come here to walk around for exercising or take some exercising with others. Also, you can enjoy the bustle atmosphere here with some kinds of music using for the exercises. Admiring the sunrise on the lake will bring you a comfortable and exciting feeling to start a new day. Besides it, walking around Hoan Kiem Lake in the evening is a very wonderful experience. Come here and glimpse the sunset, then pay attention to the beautiful landscape around the lake – the reflections of trees on the water surface, the red light of the flag – lined bright red Huc Bridge listening to the interesting music and tasting some food vendors. Just come and enjoy the specialties that Hoan Kiem Lake offers you, it is really a wonderful experience that you should not miss out when visiting Hanoi.